IF YOU LIKED THIS REVIEW AND ARE INTERESTED IN PURCHASING THE TRIBEST DYNAPRO DPS1050A, CLICK HERE TO ORDER WITH FAST FREE SHIPPING. IS VACUUM BLENDING A GIMMICK? IS VACUUM BLENDING A GIMMICK? 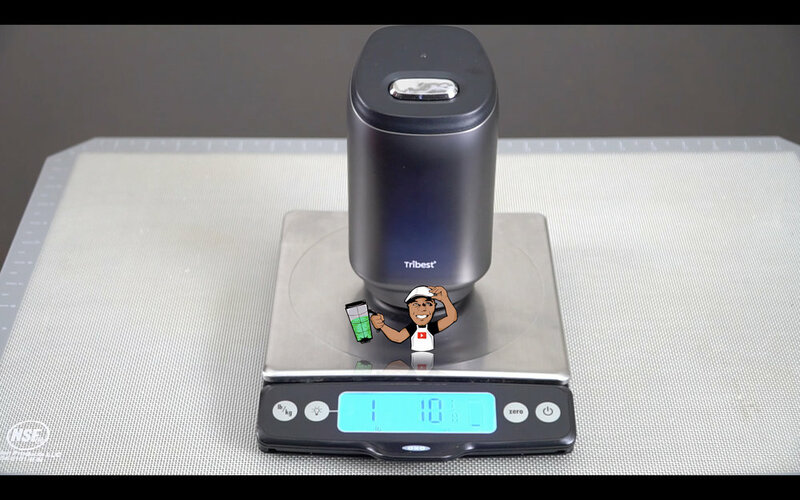 IF YOU'VE BEEN KEEPING UP WITH THE BLENDING WORLD, YOU MAY HAVE PERIODICALLY HEARD ABOUT VACUUM BLENDING. IF NOT, YOU MAY HAVE HEARD ABOUT VACUUM SEALING YOUR FOODS USING A VACUUM SEALER. THE CONCEPT IS BASICALLY THE SAME. A FEW COMPANIES BASED OUTSIDE THE USA HAVE BEEN PUSHING VACUUM BLENDING TO THE USA. THE INNOVATION IS NEW FOR THE BLENDING WORLD. ONE OF THE COMPANIES THAT ARE COMMITTED TO SPREADING AWARENESS ABOUT VACUUM BLENDING IS TRIBEST. THE COMPANY HAS CREATED IT'S OWN VACUUM BLENDER CALLED THE DYNAPRO DPS1050A. 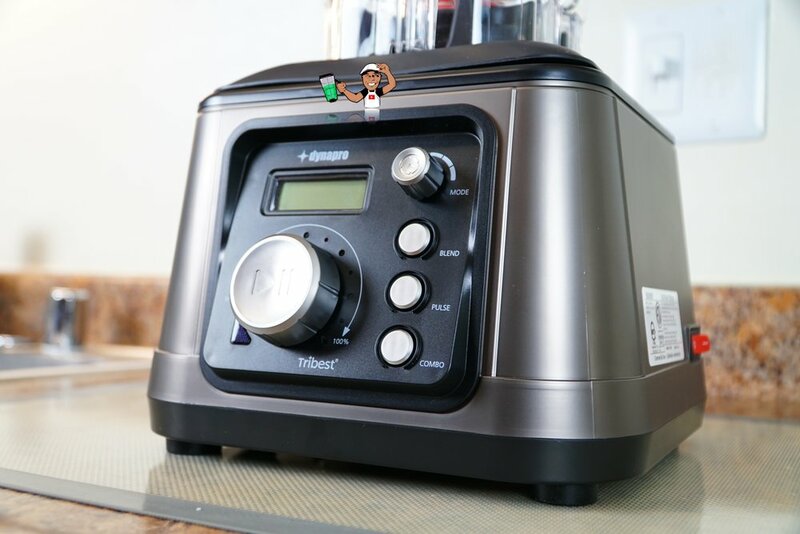 LIKE A VACUUM SEALER MADE TO SAVE FOODS FOR LATER CONSUMPTION, THE DYNAPRO COMES WITH A HAND PUMP THAT ATTACHES TO THE TOP OF THE BLENDER CONTAINER AND REMOVES THE AIR THAT WOULD OTHERWISE OXIDIZE THE BLENDING INGREDIENTS. I REACHED OUT TO TRIBEST AND THEY WERE GRACIOUS ENOUGH TO SEND ME A REVIEW COPY OF THIS TECHNOLOGY. THE TRIBEST DYNAPRO DPS1050A SELLS FOR $599.95 U.S. AND IS A WORKHORSE WITH A 2.5 PEAK HORSEPOWER MOTOR. IT'S CERTIFIED FOR HOME AND COMMERCIAL USE, AND CARRIES A 15 YEAR WARRANTY FOR HOME USE AND A 3 YEAR WARRANTY FOR COMMERCIAL ESTABLISHMENTS. 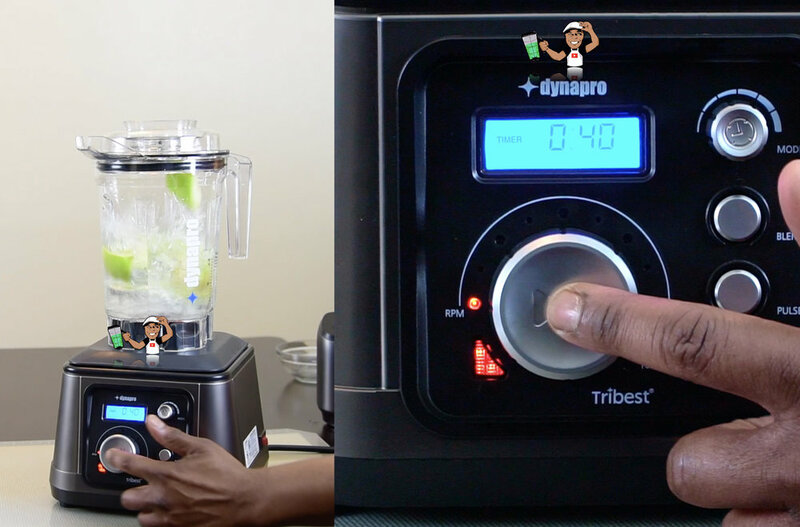 AT FIRST GLANCE, THE TRIBEST DYNAPRO IS A NICE-LOOKING MACHINE, AND IT ACTUALLY RESEMBLES A VITAMIX. ON THE FRONT IT HAS LARGE OPERATIVE BUTTONS. ON THE BACK THERE IS PLENTY OF VENTILATION FOR AIRFLOW TO PROTECT FROM OVERHEATING. THE REVIEW COPY I RECEIVED HAD AN UNFORTUNATE ANOMALY ON THE REAR UNDERNEATH THE GRILL. THE PAINT WAS FLAKING A BIT (SEE RED CIRCLED). IF YOU RUN INTO THIS ISSUE, I'M CERTAIN TRIBEST WILL HAPPILY TAKE CARE OF YOU. THE DYNAPRO BLENDING CONTAINER HAS A 64OZ CAPACITY AND HAS GOOD BUILD QUALITY WITH PRECISION STAINLESS STEEL BLADES. I LIKE HOW THE BLADES ARE DRIVEN BY METAL GEARS. 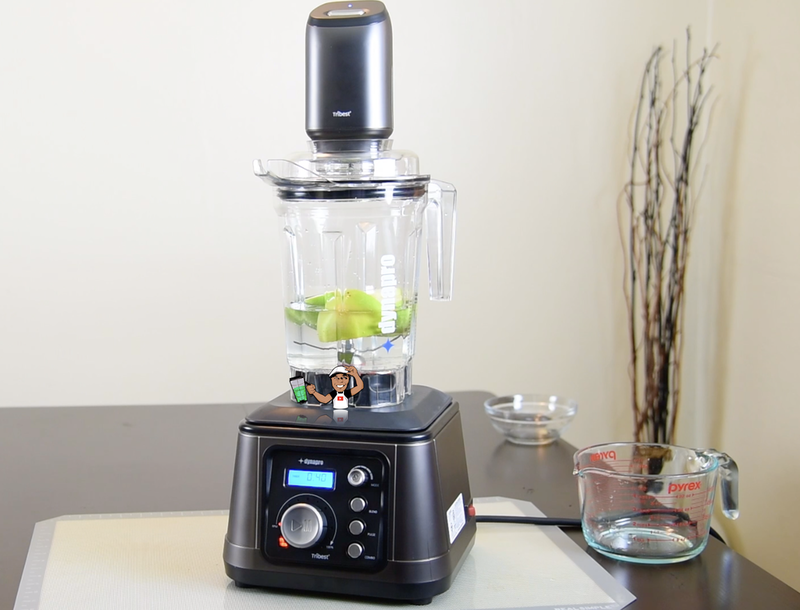 COMPANIES LIKE NINJA THAT MAKE BLENDERS SUCH AS THE NUTRI NINJA USE PLASTIC GEARS TO REDUCE COSTS, WHICH WILL QUICKLY SHOW WEAR. THE DYNAPRO CONTAINER HAS A UNIQUE FEATURE. THAT BLUE STAR SURROUNDED BY THE TWO ARROWS IS CALLED THE "RAW TEMPERATURE". WHEN THE STAR IS BLUE, THE TEMPERATURE INSIDE THE CONTAINER IS AT RAW TEMPERATURE, WHICH IS LESS THAN 118 DEGREES FAHRENHEIT. WHEN THE STAR TURNS WHITE THE TEMPERATURE IS OVER 118 DEGREES AND IS NO LONGER CONSIDERED "RAW". THIS IS A NICE FEATURE, BUT MY CONCERN IS THERE'S NO WAY TO KNOW WHEN IT WILL SURPASS RAW, WHICH CAN LEAD TO BLENDING MISHAPS. THE DYNAPRO ONE-TOUCH VACUUM PUMP IS VERY SIMPLE TO USE WITH JUST ONE TOUCH OF A BUTTON UP TOP. IT RUNS ON 4 AA BATTERIES. I HAVEN'T TESTED HOW LONG THE BATTERIES WILL LAST, HOWEVER THIS PUMP IS VERY POWERFUL, SO I WOULD RECOMMEND KEEPING A BACKUP SET OF BATTERIES. THE ONE-TOUCH VACUUM PUMP WEIGHS IN AT 1LB & 10OZ. IT'S IMPORTANT TO KNOW THAT THERE IS NO GRIP ON THE BODY OF THE PUMP SO DUE TO IT'S WEIGHT IT COULD EASILY SLIP OUT OF YOUR HAND. 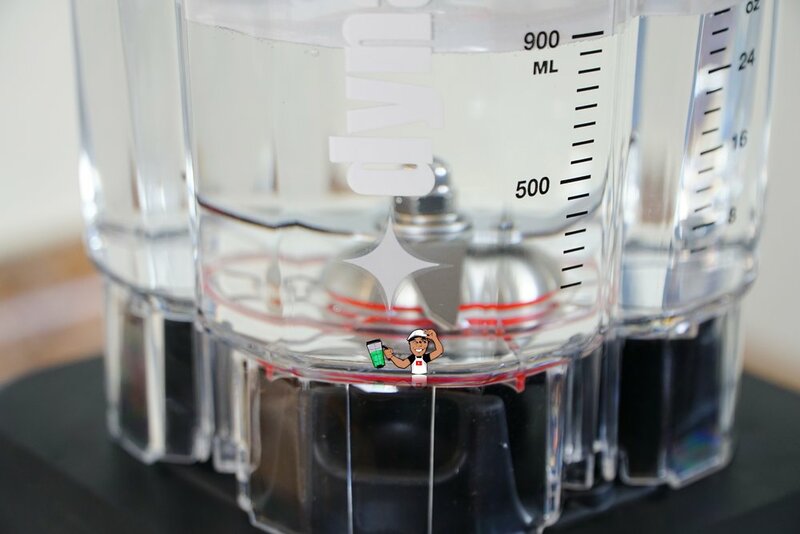 AFTER CONNECTING THE PUMP TO THE TOP OF THE BLENDING CONTAINER, IT BECOMES A VERY TALL EXPERIENCE. MY KITCHEN CABINETS ARE 21" IN HEIGHT FROM THE COUNTER. YOU MAY NEED TO PULL THE DYNAPRO DPS1050A OUT FROM UNDERNEATH THE CABINET IN ORDER TO USE THE ONE-TOUCH VACUUM PUMP. IN THE BOX IS AN ARRAY OF ACCESSORIES INCLUDING EXTRA GASKETS, AIR PLUGS, A MANUAL VACUUM PUMP, A SPOON-STYLE STAINLESS STEEL TAMPER AND AN INSTRUCTION MANUAL. UNFORTUNATELY THERE'S NO RECIPE BOOK, LIKE YOU WOULD FIND IN THE BOX OF A VITAMIX. THE CONTROL PANEL OF THE DYNAPRO DPS1050A IS AN EASY TO READ DISPLAY WITH SIMPLE TO OPERATE CONTROLS. THE MODE SWITCH OPERATES THE PROGRAMMABLE TIMER. THE BLEND BUTTON HAS PRESET TIMES OF 30 SECONDS FOR EACH PRESS. THE PULSE BUTTON PULSES FOR 30 SECONDS WITH EACH PRESS. THE COMBO BUTTON AUTOMATICALLY PULSES MULTIPLE TIMES THEN BLENDS FOR 30 SECONDS WITH EACH PRESS. THE BLENDING TABLE HAS GOOD BUILD QUALITY WITH A METAL DRIVE SOCKET. 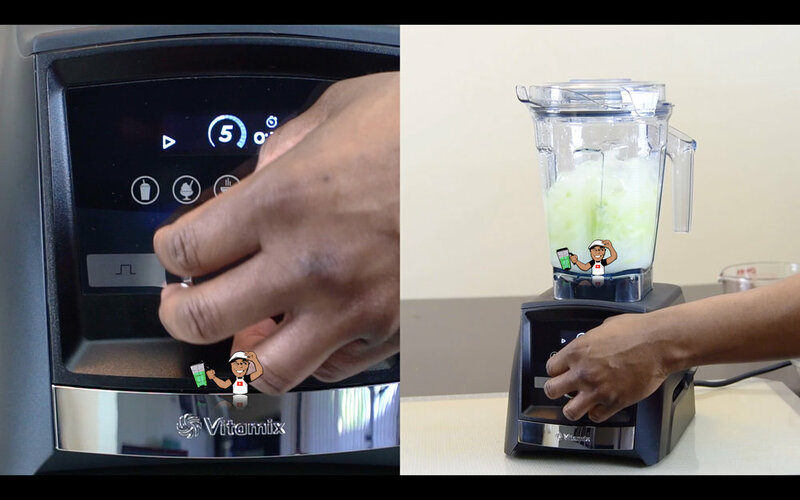 ON THE TOP FRONT END IS A BUTTON THAT ACTIVATES THE BLENDER ONCE THE CONTAINER IS SITTING PROPERLY IN PLACE. I LIKE THAT THERE IS A CORD WRAP AT THE BOTTOM. MANY BLENDERS ON THE MARKET STILL DO NOT OFFER THIS USEFUL FEATURE. THE TRIBEST DYNAPRO DPS1050A IS A RELATIVELY LARGE BLENDER. WHILE IT SHOULDN'T BE A PROBLEM FOR MANY, WHEN COMPARED TO THE VITAMIX ASCENT A3500'S SMALLER FOOTPRINT, IT CAN MAKE A DIFFERENCE IF YOU ARE THE COOK THAT ENJOYS HAVING ALL OF YOUR APPLIANCES ON THE COUNTER, AND SPACE IS IMPORTANT. I PERFORMED 3 SEPERATE TESTS. TWO OF THE TESTS WERE DONE ON THE TRIBEST DYNAPRO DPS1050A, THE THIRD TEST WAS DONE ON THE VITAMIX ASCENT A3500 FOR COMPARISON ONLY. ON THE DYNAPRO I CREATED AN APPLE JUICE UNDER VACUUM. THE SECOND TEST ON THE DYNAPRO WAS AN APPLE JUICE CREATED WITHOUT VACUUM. THE VITAMIX ASCENT A3500 BLENDED THE APPLE JUICE WITHOUT VACUUM, AS THE VITAMIX DOES NOT OFFER THE VACUUM FEATURE. ALL THREE DRINKS WERE BLENDED WITHIN 5 MINUTES OF EACH OTHER. 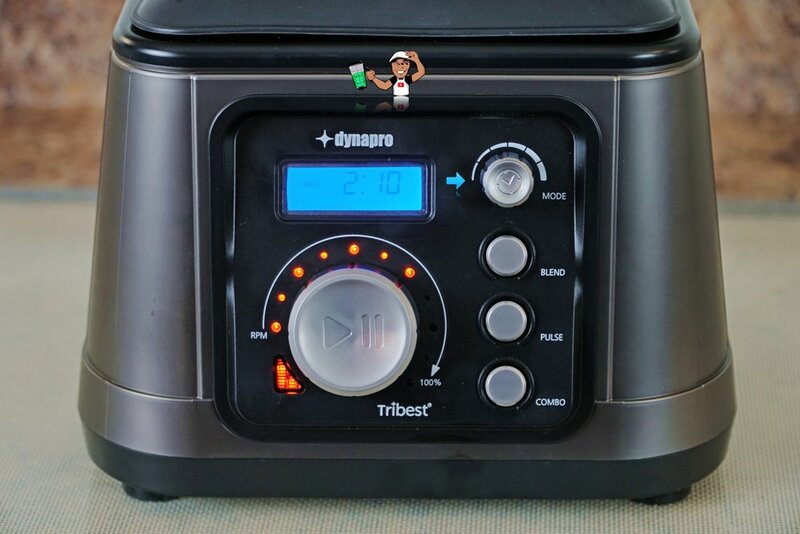 THE TRIBEST DYNAPRO'S APPLE JUICE UNDER VACUUM LASTED UP TO 45 MINUTES WITH ONLY A MINIMAL AMOUNT OF OXIDATION, WHILE THE DYNAPRO AND VITAMIX NON-VACUUMED DRINKS OXIDIZED AND TURNED BROWNISH. THE APPLE JUICE DRINKS FROM ALL 3 TESTS WERE POURED ONTO A WHITE PLATE TO TEST THE AMOUNT OF LEFT OVER PULP. 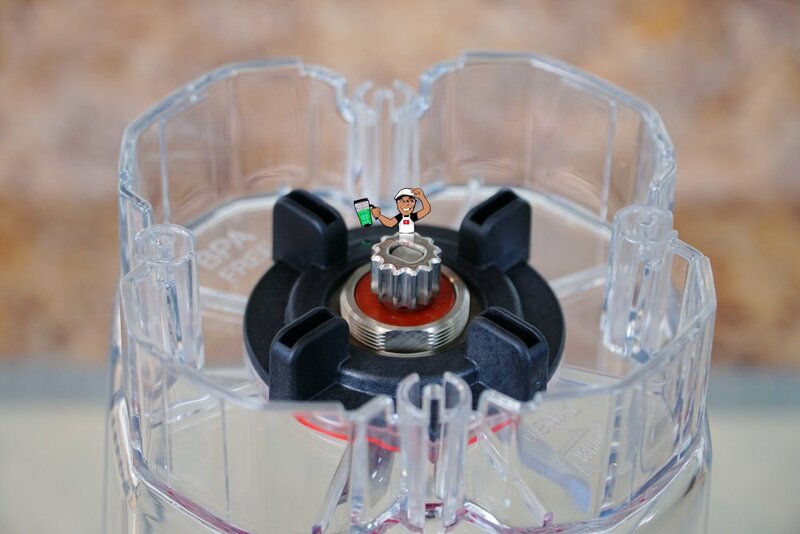 WHILE THE DYNAPRO VACUUMED JUICE HAD LESS PULP THAN THE DYNAPRO NON-VACUUMED JUICE, THE SURPRISING RESULTS CAME FROM THE VITAMIX ASCENT. THE VITAMIX HAD VERY LITTLE PULP LEFT OVER. IT WAS INDEED A SMOOTHER "SMOOTHIE". SO, WHILE THE VITAMIX APPLE JUICE OXIDIZED OVER THE 45 MINUTE TIME FRAME, THE BLEND QUALITY GREATLY OUTPERFORMED THE TRIBEST DYNAPRO DPS1050A. FOR REFERENCE ABOVE, THE DYNAPRO VACUUMED JUICE HAS THE GREEN STRAW. THE DYNAPRO NON-VACUUMED JUICE HAS A YELLOW STRAW. THE VITAMIX JUICE HAS THE RED STRAW. TRIBEST DYNAPRO DPS1050A WHAT'S NOT-SO-PERFECT? WHILE THERE IS A LOT TO LOVE ABOUT THE TRIBEST DYNAPRO DPS1050A, THERE ARE SOME NOT-SO-PERFECT THINGS ABOUT IT. THESE CHEF-STYLE BLENDERS (LIKE THE VITAMIX) TEND TO OFFER REMOVABLE LID CAPS FOR ALLOWING INGREDIENTS TO BE PASSED THROUGH WHILE BLENDING. WHEN MAKING SALAD DRESSINGS OR ADDING OILS TO SPECIFIC RECIPES, IT'S IMPORTANT FOR THE BLENDER TO SPIN AT THE SLOWEST SPEED TO REDUCE SPLASHING. I FOUND THE DYNAPRO'S LOWEST SPEED TO BE QUITE AGGRESSIVE AND WATER SPLASHED TO THE VERY TOP. 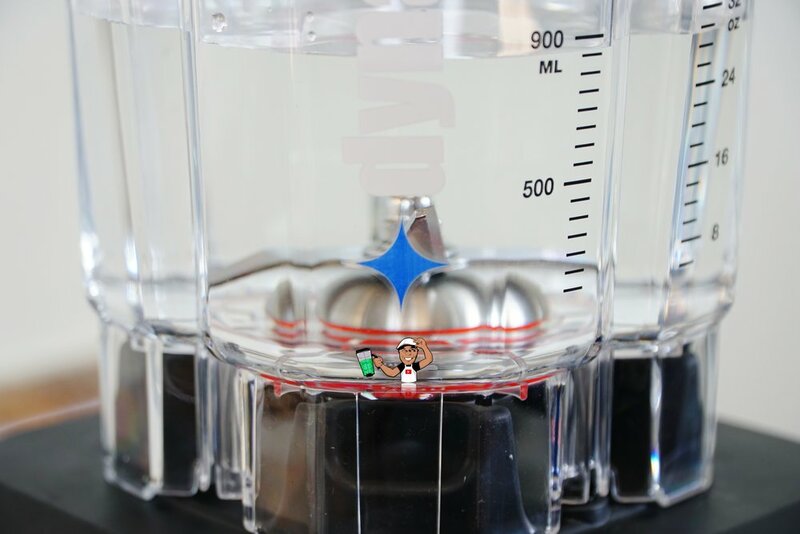 NOTICE IN THE PICTURE ABOVE HOW THE VITAMIX'S LOWEST SPEED SHOWED VERY LITTLE SPLASHING. I ALSO ENCOUNTERED AN ISSUE WHERE THE DYNAPRO WOULD CAUSE THE SAFETY FEATURE ON MY WALL OUTLET TO TRIP AND SHUT OFF. WHILE IT'S UNDERSTANDABLE BASED ON HOW POWERFUL THE DYNAPRO IS, I'VE NEVER EXPERIENCED THIS WITH ANY VITAMIX. YOU MAY NOT SHARE THIS SAME EXPERIENCE BASED ON HOW YOUR HOME IS WIRED. VACUUM BLENDING MAY OR MAY NOT BE THE END ALL IN THE BLENDING WORLD. PERHAPS THERE WILL BE MORE ADVANCEMENTS IN THE TECHNOLOGY THAT WILL SPARK THE LEADING BLENDER COMPANIES TO JUMP ON BOARD. 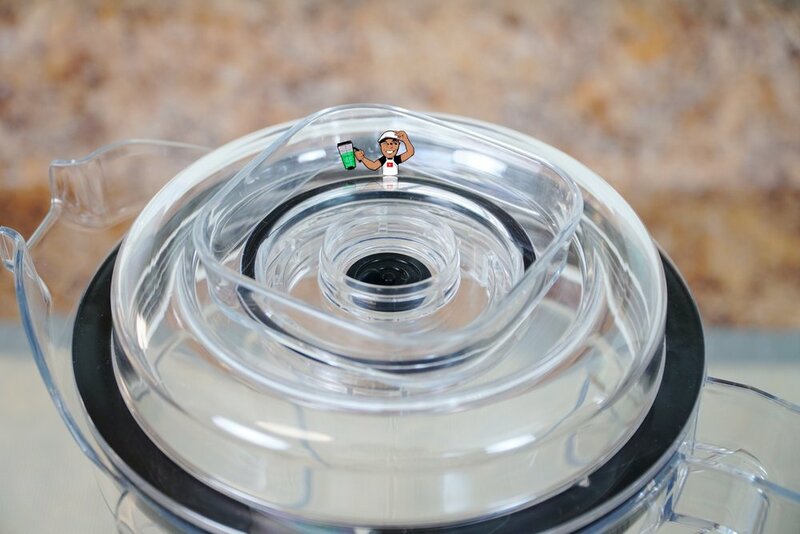 RIGHT NOW VACUUM BLENDING IS LIMITED TO SELECT TYPES OF RECIPES THAT REQUIRE NO INTERVENTION FROM THE USER, SUCH AS LESS COMPLEX SMOOTHIES AND SIMPLE SOUPS. FROZEN DESSERTS, NUT BUTTERS AND VARIOUS OTHER THICK RECIPES WILL REQUIRE THE USE OF THE INCLUDED TAMPER SPOON AND THAT WILL DEFEAT THE PURPOSE OF THE VACUUM TECHNOLOGY. IF YOU'RE READY TO MOVE TO THE NEXT GENERATION IN BLENDING TECHNOLOGY THE TRIBEST DYNAPRO DPS1050A IS AN EXCELLENT CHOICE. GOOD BUILD QUALITY, GOOD FEATURE SET AND EASY TO USE. 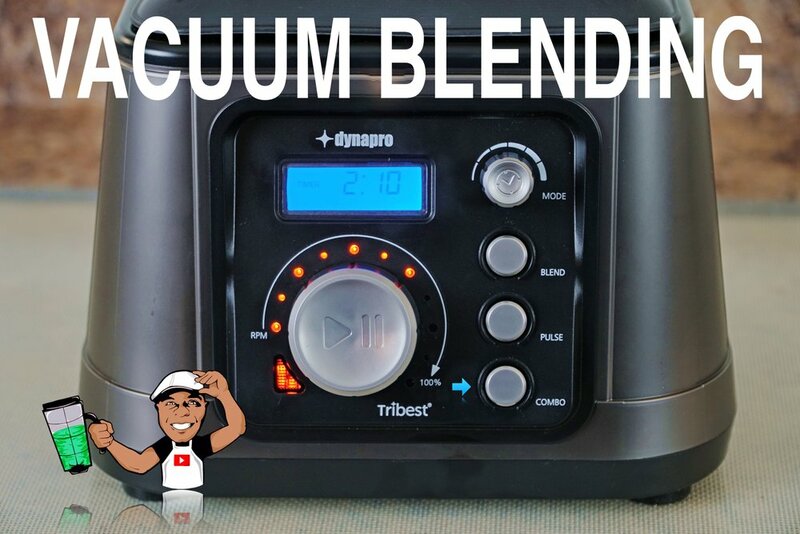 WHILE THE VITAMIX EDGES IT OUT IN BLEND QUALITY, THE TRIBEST DYNAPRO WILL STILL TURN OUT GREAT RESULTS.